mikodesign: Yvestownfair and free shipping!! Hi there, hope you are all doing great! I'm back from my holidays and back to work too. I will share some holiday pictures next week. I'm busy preparing for the Yvestown fair this saturday, I'm really looking forward to this fair. 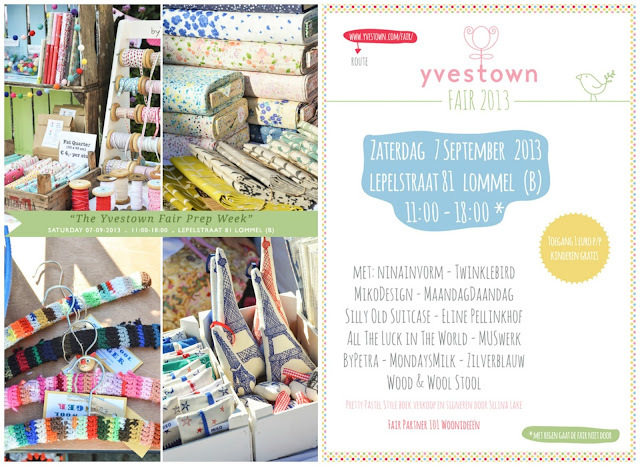 Last year was so great, Yvonne really did a great job with creating this fair, there will be some really nice sellers(bloggers) with their lovely products, goodie bags from 101 woonideeen for the early birds and a raffle to win a bag/basket with goodies from all the yvestown fair sellers. I really hope to see you there this saturday !! For all of you who can't make it to the Yvestown fair this saturday and who missed out on the last free shipping offer, I offer free shipping (international) in my Etsy shop untill this monday, just enter the code ' yvestown' . Ooh ik ben reuze benieuwd! Heb er zin in! Hallo, Ik ben langsgekomen en kocht een leuk DIY pakket Frida. Ik ben een Frida fan en nu ook een Miko Design fan. Je leest er ook over op mijn blog.